This post was first published on the Slalom Technology blog. The room erupted in laughter as the loading screen for the GetZa app displayed a cat, spinning on top of a pizza, floating in space. That was when I realized how useful the hackathon would actually be to all the participants. 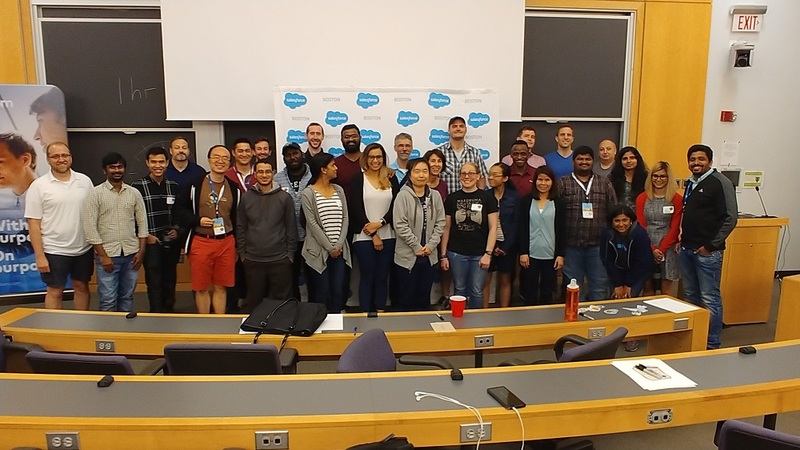 Last Saturday was the second annual hackathon for the Boston Salesforce Developer Group, and as a co-organizer and judge for the event, I had a chance to see first-hand all the inspiring work and learning that the teams put on display. Having experienced a few of these competitions now as both a participant and a contributor, a few highlights really stand out as best practices and helpful tips. I’m already looking forward to the next one and I hope you consider planning your own with the following playbook — You’ll find that it’s well worth the effort! 9 hours later — We all made it! How hard could it be to schedule a place and time for people to meet? The answer, as you may have guessed, is that it’s always more work than you might expect, so you’ll want to find others that are up to the task. Luckily, in Salesforce circles, that’s not all that difficult — Developer Groups, the Success Community, Salesforce Partners, and Twitter feeds are all full of like-minded folks who are always looking to get involved. 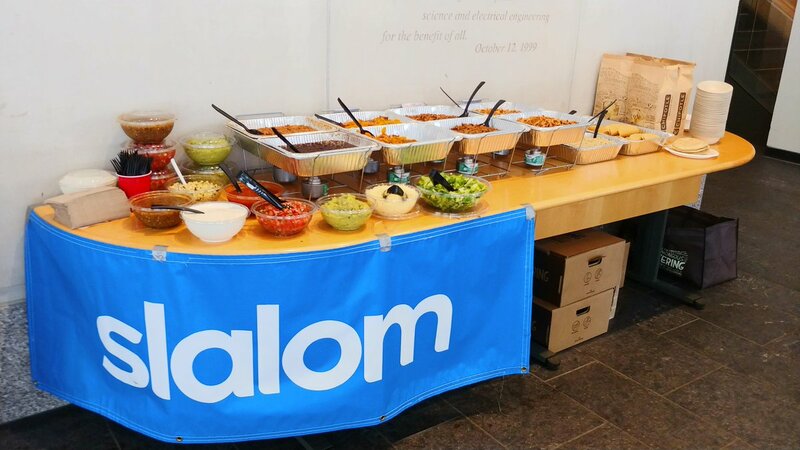 After I saw the success that was the first SFHackX, I reached out to my manager to see if Slalom would consider sponsoring this year’s edition. Before long, I was on a Slack channel with Bing and Kartik from the Boston Salesforce Developer Group, listing out all of our todos and next steps to get the hackathon off the ground. Needless to say, it couldn’t have happened with their and Slalom’s support! How many people to we really expect to attend? How can we simply split expenses between sponsors? How good is the WiFi? How detailed do the requirements need to be? The room we eventually settled on for the hackathon this year was an amphitheater at Harvard that had the luxury of outlets at every seat. The large adjacent lobby area was also perfect for a catering setup and a space to break from the buzz in the room. Although it can be harder to find a sponsor that works for a university (thanks Corey! ), one significant advantage of being on campus is that you can target Salesforce newcomers and promote through existing student channels. Even a perfectly planned and executed hackathon will not be successful unless you can get the word out to your target audience. Your sponsors will most likely have some good ideas and existing channels for doing so, but it helps to also have a branded website or a Meetup event to direct users to for sign up. Think of a good hashtag (like #SFHackX) and start using it as early as possible! One item to remember too is that promotion during the event can attract stragglers as well as catch the eyes of local MVPs or Salesforce influencers online. Make sure your Instagram and video skills are up to date, and encourage participants to share your hashtag — Maybe with a special prize for the person with the most activity? Why is my knee itchy? What’s that rash on my ear? With Dr. Bot, all of your medical questions have simple answers! Using a simple point-and-click interface, Dr. Bot’s admins can sort through all sorts of ailments and give you the right solution to get you back on your merry way. What’s more, Dr. Bot will follow up with you a few days later to make sure its diagnosis and remedies were successful. Two things you’ll want to pay close attention to are the team-making and the judging processes. Those can be the most uncomfortable times for many of your attendees, so a little help will go a long way. Make the judging less formal for example by having a “crowd favorite” award or by using the judges as coaches for each of the teams. Ultimately, although you can’t control what participants will take away from the hackathon, you can help shape their experience by focusing on the “why”. Is your goal to get more people to use the Lightning Platform? Focus on simpler challenges that feature clicks over code, and make sure to avoid topics that aren’t fully documented or might be easy to get stuck on. Looking to provide local developers with an entertaining day to share learnings and “level up”? Make sure you are available for helping out teams that have any questions throughout the day. For this year’s SFHackX, we chose to provide 2 separate tracks for participants to select their hack from. One was the Rookie Trailblazer track that focused almost exclusively on clicks — albeit with novel topics such as Einstein Bot and Prediction Builder — while the Lightning Pro track delved into both types of Einstein APIs. Although some of the prompts required a bit of imagination and hand-holding, we tried to ensure teams weren’t spending too much time on any particularity, and instead were looking at their solution as a whole. So what are you waiting for? Make it your personal goal for the year to organize a hackathon for your colleagues, your local Developer Group, or a local meetup, and share your best practices with the rest of us!